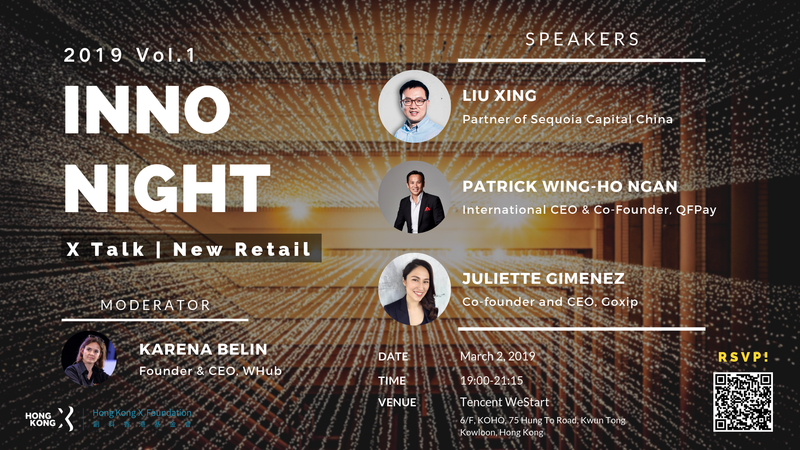 First Monthly Event INNO Night: X-Talk | New Retail on March 2 (Next Sat)! Our distinguished guests have accumulated extensive experience in the field. Wanna grab the chance to learn about the top investor’s view on New Retail trend, the challenges and innovations in the transition from traditional to New Retail, as well as startups’ influence in New Retail? Join us that night to enjoy their amazing sharing and fireside panel discussion! He focuses on investments in TMT and consumer sectors. Mr. Liu has led and participated in Sequoia's investments in Vipshop, Alibaba, JD.com, ZTO Express, Deppon Logistics, Ant Financial, JD Finance, Ziroom, Tuhu, Klook, Luojisiwei, Baicizhan, PurCotton, Urban Revivo, Nome, Dingdong, Xianfeng Fruits, Today CVS, 7 Days, Ali Picture and a number of other TMT and consumer companies. Mr. Liu received his MBA from The Wharton School of the University of Pennsylvania, M.S. degrees in Computer Engineering and Telecommunication and Network Management from Syracuse University and B.S. degree in Management Information Systems from Fudan University. Patrick is connecting the world through mobile payment, one country at a time, with QFPay International – a leading mobile payment technology, solution and service provider with presence across 13 markets in Asia and Middle East. With 18 years of experience in cross-border strategy & business development, corporate finance and capital markets solutions, Patrick is the CEO & Co-Founder of QFPay International Limited. Prior to QFPay, Patrick held senior management positions at global investment banks and international retail conglomerate groups in China, Hong Kong and UK; he has also served as Chief Financial Officer and Executive Director of a Hong Kong Main Board-listed company. Juliette Gimenez, a highly passionate serial entrepreneur, co-founder of Goxip. She has extensive experience in starting up companies &driving multi-million dollars sales growth in the e-commerce area, particularly from an early stage level onwards in Southeast Asia & HK. She first started as an i-banker doing market analysis and asset management consultancy for over 4 years. Then joinedanearly-staged startup in Hong Kong called Ubuyibuy which was a group buying platform offering discounts to customers. The company was later acquired by Groupon and Juliette stayed at Groupon HK as their VP after the acquisition for building and growing to more verticals outside of Daily Deals, like Travel and Products. She was with Groupon until their IPO on Nasdaq in 2011 before joining LivingSocial as the head of sales in Asia. In thenewcompany, she was overlooking the operation of 5 countries in Asia which were Philippine ,Indonesia ,Thailand, Malaysia andSouth Korea. She was a very hands on person setting out sales and outlining strategies along with strengthening the company’s regional partnership and market share in different countries. After growing LivingSocial to dominating the Thailand and Philippine market with more than 90% market share, she left to Bangkok and joined Cdiscount Thailand(part of Cnova) - now the No 4 e-commerce pure-player in the world. As a founding team member and also as Chief Revenue officer for CDiscount, she grew the e-commerce site from earning 0 bahts to achieving 400millions bahts monthly sales within 11 months. The company Cnova was later listed on Nasdaq in December 2014 and become the #2 biggest e-commerce site in Thailand with more 110 employees. In 2016, Cdiscount Thailand was later sold to Big C for an estimated 70 Million USD. Karena Belin is Founder and CEO of HK’s biggest startup platformand community builder WHub (whub.io) and Founder and COO/CFO of AngelHub (angelhub.io), Hong Kong’s first (approval in principle) SFC licensed startup investment platform for professional investors and global startups raising growth capital. Since 2013, she has been passionate about entrepreneurship and a leader in the startup scene. She acts currently as speaker, mentor and judge at events and organisations such as the APK (Asia Pacific Conference of the German Industry), Chicago Booth GNVC, Google EYE, RISE Conference and Web Summit, Jeju Peace and Prosperity Conference, Fin Tech Valley Vizag India, Techsauce Thailande, Tech Open Air Berlin, IFLR, Nexchange, Techstar’s StartupWeekendHK, global YPO YNG+ and more. She is a member of the Global FinTech Core Group at the Government of Andhra Pradesh, Ex-Com member and Vice President of The Indus Entrepreneurs Network (TiE) HK, member of the FinTech Association of Hong Kong (FTAHK), President of the board of the parent organisation (PFO) at Hong Kong International School, as well as driving diversity and inclusion as member of WOW at the American Women’s Association. Karena Belin holds a double diploma in business and administration from the University of Mannheim and the MBA business school ESSEC in Paris. She has worked 15 years for Procter & Gamble in various roles including Finance, Sales and Strategy across Europ e, North East Asia and Greater China before co-founding W Hub. She has an extensive background in business and financial planning, business acquisition and integration (leading Gillette integration in Japan).